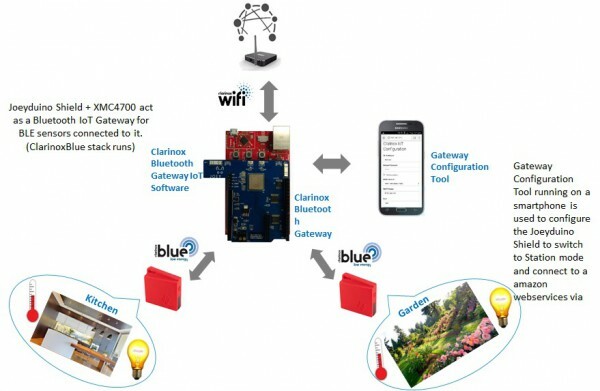 Produktinformationen "Clarinox Starterkit: XMC4700 Wi-Fi AP/STA with BLE for Joeyduino Shield Rev2"
For developers who are willing to develop WiFi/BLE gateway applications (using any combination of BLE peripheral, BLE central, WiFi AP, WiFi STA, WiFi P2P) on Infineon XMC4700 Relax Kit. APIs for BSP integration and application integration; Infineon XMC4700 Relax Kit BSP code; Clarinox Wireless Stack & Clarinox Debugger, time limited to 20 mins for test and simple PoC purposes. Weiterführende Links zu "Clarinox Starterkit: XMC4700 Wi-Fi AP/STA with BLE for Joeyduino Shield Rev2"
Kundenbewertungen für "Clarinox Starterkit: XMC4700 Wi-Fi AP/STA with BLE for Joeyduino Shield Rev2"